As depicted in Nina Beveridge’s intimate documentary Little India: Village Of Dreams, premiering on TVO July 1 at 9:00pm, the stresses of Old World conflicts and New World challenges have reshaped the neighbourhood. As a result, Little India is now pan-South Asian, with shops and restaurants representing Indian, Pakistani, Bangladeshi, Nepalese and Sri Lankan cultures (alongside gentrified Westernized coffee shops, galleries and health food stores). Behind the storefronts, family dramas play out. 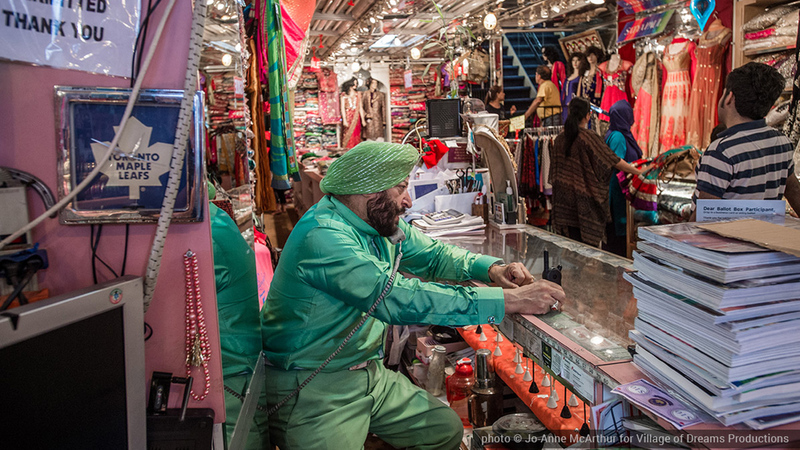 Little India: Village Of Dreams introduces the patriarchs and matriarchs of Little India’s businesses, but focuses on the Millennials and Gen-Xers who feel the lure of Canadian life and conflicted loyalty to their parents’ legacies. “I love it and I hate it,” says Ronak Diwan, of working in the Paan snack shop started by his father Raju. Henna artist Sumaiyah Shah edges away from her mother’s salon business to collaborate on an events company with her husband. Meanwhile, her athletically-inclined sister Aysha Khan makes plans to join the Toronto Police. Others embrace their legacy – literally in the case of style-conscious Chandan Singh, whose very name was attached by his parents to the traditional wedding apparel store Chandan Fashion. Harleen Khorana’s red hair and pale complexion almost compels her to prove her “Indian-ness” by dedicating herself to her parents’ store Kala Kendar. And – still mourning the death of his father – Adam Sayani emerges in front of our eyes as a boyish community leader, sharing, with his mother Gulshan, the operation of the famous and popular Lahore Tikka House. Little India: Village of Dreams was produced in association with TVO. It is produced and directed by Nina Beveridge, and produced and edited by Paul Hart. A film and video creator for 30 years, Beveridge co-produced the acclaimed and influential animal rights documentary The Ghosts In Our Machine, a film by Liz Marshall. Jatinder Pal Singh behind the counter at Chandan Fashion. Photo ©2016 Jo-Anne McArthur for Village of Dreams Productions Inc. Hot Docs: First Look At 2015 Films – A Different Drummer is selected!